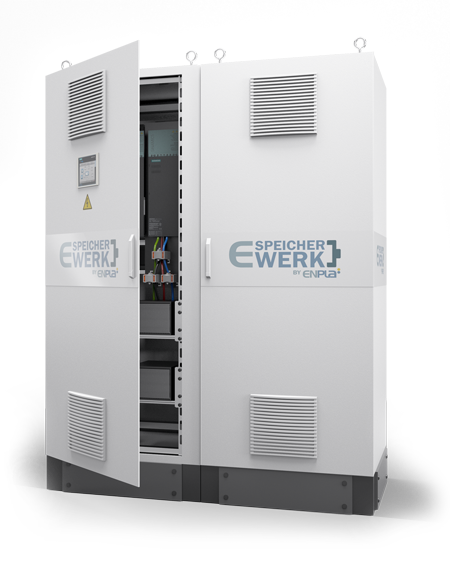 Tailor-made produced, does the E-SpeicherWerk power storage systemorientate on the requirements onsite, and will be conceptualized to fit its specific environment. This also allows integration into existing energy management concepts as well as linkingto a software system via interface connections. The performance parameters for your company´s consumption and the company´s in-house consumers have optional power electronics with 17, 36, 55 or 110 kW for nearly all requirements. The storage capacity in kWh is scaled and configured to individual needs. Other features are included and will be offered on request.